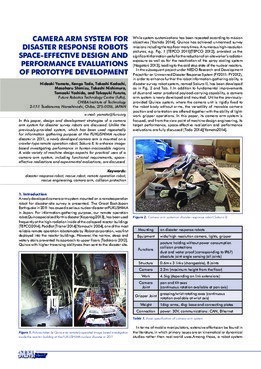 In this paper, design and development strategies of a camera arm system for disaster survey robots are discussed. Unlike the previously-provided system, which has been used repeatedly for information gathering purpose at the FUKUSHIMA nuclear disaster in 2011, a newly developed camera arm is mounted on a crawler-type remote operation robot, Sakura II, to enhance image-based investigating performance in human-inaccessible regions. A wide variety of machine design aspects for practical uses of a camera arm system, including functional requirements, space-effective realizations and experimental evaluations, are discussed.